A young woman is anointed with chrism oil. Image by John Ragai/Flickr (CC BY 2.0)..
A few months before our wedding, my wife showed me a picture of a friend’s wedding that included a laying on of hands. The picture, taken from the balcony of the church, shows a spiral of arms emanating out from two people. It is a beautiful picture, vibrant colors surrounding a splash of white. My wife said that this laying on of hands embodies physically what our liturgy proclaims about marriage. She was right. Yet why being touched was spiritually meaningful remained elusive to me. Instead of bringing me comfort or support, it filled me with nervousness and apprehension. I could appreciate the aesthetic value, but the spiritual nature of being touched escaped me. Every Sunday night the church I serve hosts jazz vespers, often with time for anointing for healing. At a designated point of the service, the musicians play while people are invited to come forward to receive oil and the laying on of hands. Initially, the physical contact was too intimidating for me to attempt. It seemed too personal and intimate an action to do incorrectly. Instead of placing my hands on the parishioner’s head, I marked their forehead with oil and folded my hands while offering a brief prayer, hoping they wouldn’t be offended by the lack of physical touch. Only over time did I start to become comfortable gently placing my hands on the parishioner’s head. A pastor is blessed by his congregation before heading to university. Image by Jay Wilson/Flickr (CC BY-NC-SA 2.0).. The rite itself is messy and awkward at times. I strain to hear the names of family members, friends, and co-workers over the music behind me. Remembering names and ailments poses its own challenges. Was it her aunt who is sick or her niece? Is her name Ashley or is that her aunt’s name? The small metal containers of oil are sleek but nearly impossible to handle when both hands are slippery with oil. While my hands are on someone’s head, it sits precariously between my thumb and forefinger. Even worse, I recently discovered that holding our red hymnals with oil on my hands will leave red streaks on anything I touch afterwards. I recognize a few faces every week, but the majority are visitors. Most have someone specific they’d like to pray for. A family member or a co-worker. Many come to ask prayers for themselves. Others want prayer for all people, for peace, or for justice. All share a sincerity and vulnerability that continues to surprise me. Our culture may encourage oversharing, but it also pressures people to meticulously curate their public lives. Listening to the requests for prayers often feels like reading clippings from the cutting room floor of our life together. The quiet hurts and fears, all given voice, become part of our story again. When I first placed my hands on people’s heads, I wondered what it is about being touched that brought them comfort. Perhaps it is because our culture does not encourage such intimate contact. Perhaps it is because it reminds them of their baptism. Perhaps there is a neurological explanation. But I now look not so much with curiosity at their desire but with admiration at their courage. The courage to ask for prayer. The courage to trust a stranger with the hidden parts of their lives. The courage to be touched. Perhaps these holy moments are not meant to be explained so much as experienced. 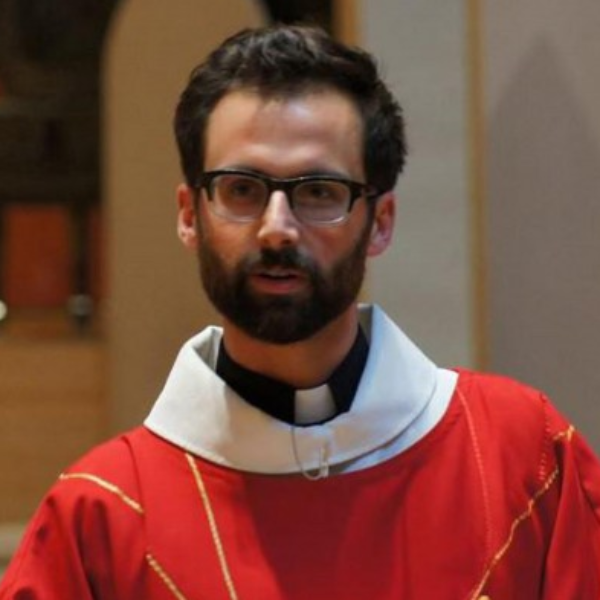 Joseph Paillé is the vicar at St. Peter’s Church in Manhattan and a candidate for ordained ministry in the Evangelical Lutheran Church in America. He lives in the Bronx with his wife, Anna.